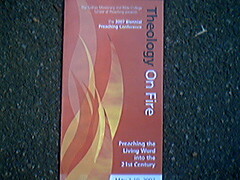 SMBC has a preaching conference next week. With Dale Ralph Davis, Don Carson & others from college speaking. It's run every 2nd year. I'm looking forward to it! # On top of work - so I can enjoy preaching conference. # People coming - encouraged & stretched. # The week will go according to plan.